What can I expect before the PinPointe Laser Treatment? Your podiatrist will perform a comprehensive evaluation of your feet and discuss the different treatment options that best work for you. He will take the time to explain the Laser procedure, patient expectations, and what to expect after treatment, recommendations and follow-up care that may be needed to completely eliminate the fungal infection. To prepare for your laser treatment we recommend removing nail polish from the affected nails 1 day prior to treatment. Is the PinPointe Laser treatment covered by insurance? Is the PinPointe Laser have FDA approval? Is The PinPointe Laser FDA Approved? Yes. Clinical studies for the treatment of onychomycosis with PinPointe Laser began in November 2007. In fact, PinPointe was the first laser device to receive FDA clearance for the temporary improvement in clear nail growth. Thinking about PinPointe Laser treatment for you nails? A Morton's Neuroma or (traumatic neuroma) is a term for a neuroma that develops in the forefoot, or ball of the foot, that is caused by repetitive trauma. It most commonly occurs between the 2nd and 3rd metatarsal bones. What Causes a Morton's Neuroma? A Morton's Neuroma is a mass of scar tissue that accumulates around a nerve, that is often caused by trauma, usually repetitive trauma or chronic irritation to a nerve in the foot. Will My Nail Fungus Come Back? Sol Foot & Ankle Centers in Long Beach provides comprehensive treatment for the elimination and prevention of toenail fungus. However, with all fungal infections there is a risk of recurrence because the fungus is present in our environment. There are a variety of new strategies available to help the prevent the spread and recurrence of fungus that affects the skin and nails. Athlete's Foot (tinea pedis) commonly occurs between the toes and soles of the feet and may cause symptoms such as itching, burning, pain and scaling of the feet. Nail Fungus (onychomycosis) is a fungal infection of the nails causing them to become discolored, thickened and brittle. If you're suffering from any of these symptoms the fastest way to cure your fungal infection is getting immediate treatment. Waiting for the problem to go away can often make the infection worse. If you think you may have a fungal infection, call our office at 562-433-0478 and get help today. Is Laser Treatment for Toenail Fungus Covered by Insurance? The PinPointe Laser for treatment of nail fungus, onychomycosis, is considered aesthetic and therefore the procedure itself is not covered by health insurance. Fortunately, Sol Foot & Ankle Centers offers affordable pricing options. Office visits, follow-up care and additional foot treatments may be covered by insurance. Take the first step towards clear nails with the clinically proven PinPointe Laser! How Does The PinPointe Laser Work? The PinPointe Footlaser uses light to treat nail fungus by targeting the fungus that lives in and under the nail. As the laser passes through the nail, the fungus is heated, without causing damage to the nail or the surrounding tissues. Although the fungal infection is treated, the nail will not become instantly clear. Improvement in the appearance of the nail is seen as the new nail grows in. My toenails are thick and yellow - Do I have a fungus infection? Toenail fungus (onychomycosis) is the most common cause of abnormally shaped and/or discolored toenails. Toenails infected with fungus often become thick, brittle and have crumbly or powdery debris on top or underneath the nail. Toenail fungus can also cause the nails to appear a variety of different colors including white, yellow, brown or sometimes even black. 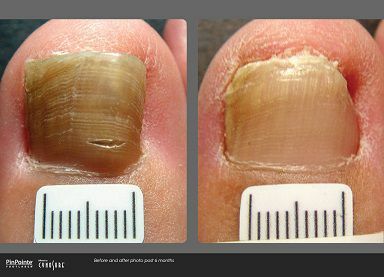 If you think you have a toenail fungus delaying treatment will only make your infection worse. Prevent the spread of fungus to other areas of the foot by scheduling your complete foot exam today. Give us a call at (562) 433-0478. Not ready to schedule your appointment? Want an over the counter anti-fungal medication that actually works? Get help for your athlete's foot or toenail fungus with podiatrist recommended products are our sister store Foot Traffik, located next to our podiatry office in Long Beach, CA. When to Get Treatment for Toenail Fungus - The best time to treat nail fungus is as soon as possible. The longer you wait the more damaged the nail beds become. PinPointe Laser Treatment for Toenail Fungus - The FDA approved PinPointe Foot Laser offers an alternative in treating nail fungus with out the risk of taking oral medications that may damage the liver. Black Toenail Treatment - Having your toenails turn black is a potentially serious problem that can happen to anyone. Black toenails are common among long distance runners. Should I have surgery for my plantar fasciitis heel pain? If you have been diagnosed with plantar fasciitis and have been recommended to have surgery... STOP! There are numerous treatment options for plantar fasciitis and heel pain that DO NOT involve surgery.